Stand-up desks have a variety of long lasting health benefits including burning more daily calories, boosting focus and productivity, improving posture and overall information retention, keeping the body and mind awake and reducing risk of heart problems. Aside from promoting health, stand-up desks save space and might just encourage more creativity. It is worth trying out with all these considerations. If you would like to try one though, you must think about which one will work best for you. Here are some things to think about while shopping for your stand up desk. Every classroom has its own unique environment, starting with the square footage. Many stand-up desks are relatively small and can fit anywhere. Others are big enough to hold whole projects. If you are pressed for space or only need a little workspace, you might want to go with one of the smaller models. The Up-rite Workstation by Balt, for example, is a simple to use, ergonomic solution to add energy to your working environment. This sit and stand desk is mobile and easily adjustable from sitting to standing. Even for tall people, the Up-Rite desk helps you Get Up, Stand Up! If you need a stand up desk that can accommodate enough space for large projects, consider Luxor’s Crank Adjustable Stand Up Desk. This desk offers a large workspace in two sizes, 40-inches wide and 60-inches wide. The crank allows for effortless height adjustment from sitting to standing. This desk is also mobile and easy to maneuver with the four 3-inch casters with two locking brakes. Stand-up desk tops can come in a number of stylish shapes. There are triangles, squares and other exotic shapes to chose from. The Kaleidoscope Stand Up Desk by Scholar craft, for example, comes in several different desk top shapes. 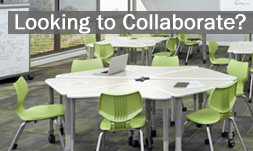 The many-sided shapes can promote cooperation as everyone can stand around the desk and work on their own side. The range of shapes allows you to pick the one that fits your space best. Consider what you want to use the desk for: if you want to use a computer on it, you will want to use a shape that your computer fits on. As mentioned earlier, there are several stand-up models that can transition into sitting desks for when you get tired of standing. A person who spends the entire day at his or her desk may appreciate the ability to switch from standing to sitting. It may also allow more than one person to use the desk, as some people need to sit more than others. 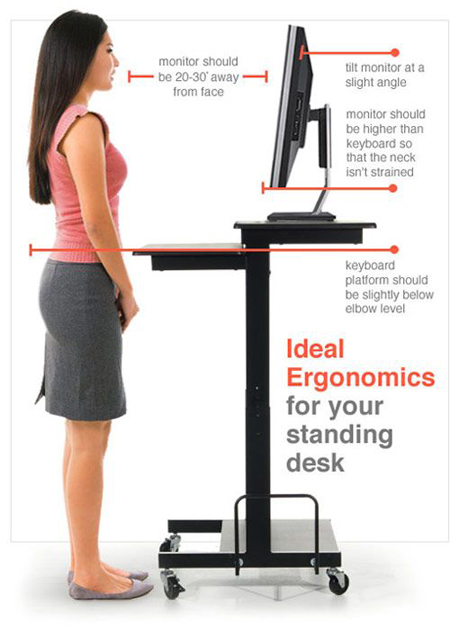 There are many models of stand-up desks that come with footrests or book bag hooks. Footrests could be an important consideration for someone dedicated to standing at their desk all day. Having their foot up for some of the time is healthy and comfortable. The AlphaBetter Stand-Up Desk by Safco features a swinging Patented Pendulum Footrest, allowing students a noise-free output for expending their natural energy, burning calories and fidgeting. This desk is a good fit for students exhibiting ADHD. It is also height adjustable so students have the option to sit or stand and swing their legs. Desks with book bag hooks are great for classrooms and schools. The ability to hang up bags on desks eliminates them from being scattered around pathways where people can trip over them. This reduces safety hazards and promotes fire safety codes. Students carrying a heavy load of books might appreciate the ability to hang their bag up as well. The stand-up desk is a nice addition to many sorts of places if you pick a suitable one. Once you have taken all these points into consideration, you are ready to hunt for your new desk. In fact, you can start your search right here. Contact us anytime and we will help you select the perfect desk for you. Thank you so much for mentioning that there are models of stand-up desks that can transition into sitting tables as well. I just heard that my son’s school district is thinking about getting stand-up desks for some of its classrooms to encourage activity in its students. If I were them, I would probably get a school desk option that can be both standing and sitting so that the students could do a mixture of them.